This shower curtain design requires no liner. This fabric shower curtain is designed and produced by well-known German brand Kleine Wolke, established in 1968, and is backed by their quality guarantee. Quick-dry and easy-care polyester fabric, durable and long wearing. 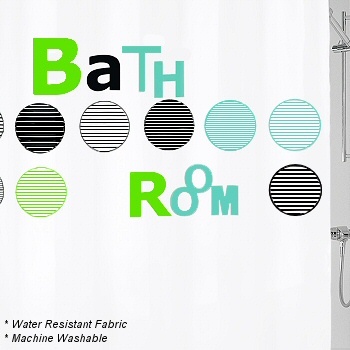 Mint : Contemporary fabric shower curtain design with large graphic which spells bathroom along with large graphic circles. The colors range from a bright spring green to a minty blue green color and black.